If you are in search of an over 55 community in or near Orlando, Florida, there are many compelling reasons to call Hyde Park home during your retirement. First, Hyde Park is a close-knit community where residents create long-lasting friendships and joyous memories. More than a just a place to live, Hyde Park is a community of likeminded retirees who want to pursue an active retirement lifestyle in a professionally managed and gated setting. Second, the streets of our 50-acre community are lined with quality crafted manufactured homes featuring updated appliances, modern fixtures, and low-maintenance exteriors. Availability varies, although we generally have a wide variety of floor plans and prices to choose from. Fourth, the on-site amenities at Hyde Park are second to none. 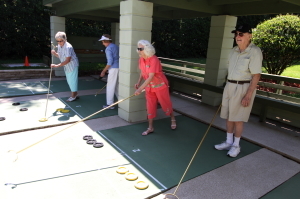 Our spacious community clubhouse has a fully equipped kitchen, exercise room, billiards room, large swimming pool, Whirlpool spa, and facilities designed specifically for group activities like cards, bingo, dominoes, and needlepoint. If you’d like more information about Hyde Park and the many reasons why it’s such a popular over 55 community near Orlando, FL, please contact us today: 800-888-3789.